Steven Gullotta Goth, Electrometal It really is hard for me to settle my teeth straight down into Lovelorn Dolls' first album, The House of Wonders. And, mainly the reason I say that is because it is electro metal and gothic in a sense, but only just so. To me, it just sounds more like rock, but nothing that I can really say I haven't heard before, and nothing that really gets me moving all too much. Yes, sure, the lead singer of the band, Ladyhell, has a decent voice, but a lot of the times it is marred by the electronic effects that surround most of the songs. And that really drags it down a whole lot, and I feel like I'm almost repeating what was said in a previous article that reviewed After Dark. So, let me move onto new ground, instead. I really am having a hard time picking out a song that can raise the bar on the album, as a set example of what great music from this band can sound like. Sometimes, it sounds like they're trying to be too hard for the set tone of the singing, and other times it sounds like they're trying to be too soft, as if they just cannot find the right level of anger to coordinate at. But, I do digress, I do not mean to completely harass the album at every corner it takes. It's still enjoyable, despite my bitching. I can find myself getting caught along a few of the songs, but not all. Most are just okay, and can't really wiggle themselves inside my thick skull, but others are able to penetrate my outer walls and sneak through my defenses, such as Mother of the Universe. The duet of voices caught my attention, and had me stuck like headlights do to a deer in the middle of the road. Only, I don't get hit by a car, I'm just blasted with music. And not killed. Just settled at peace. And, well, now that I think about it, this was a horrible analogy to use. 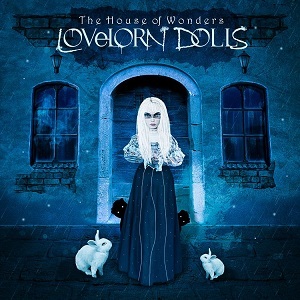 It really is hard for me to settle my teeth straight down into Lovelorn Dolls' first album, The House of Wonders. And, mainly the reason I say that is because it is electro metal and gothic in a sense, but only just so. To me, it just sounds more like rock, but nothing that I can really say I haven't heard before, and nothing that really gets me moving all too much. So, what we, rather, what I have here is a decent release. It's flawed, as most albums are, and can usher in greatness with tweaks here and there. I would love to here less digital effects on the vocals, that's for certain; I think Ladyhell has a great set of chords that don't need to be tampered with. Let the bird fly freely as nature meant for it to be. HAH. There's a good comparison. And, well, I suppose something unique needs to happen with this band. The music is good, but, then again, I'm sitting here thinking to myself, "I could be listening to something completely out there and original instead of this." And that's never a good sign. But, nonetheless, I can still enjoy this album, so I shall not say it's bad, but nor can I say it's great. It's decent, and I can accept that.